Previous post: This Song is About You? The end to a long day. The ride home, passenger style. Head pressed against the window, but doing so did not produce a fog. No distraction. No cloud for an opaque view. The onset of dusk already toted a haze, which was puzzling enough to contemplate its origin or even why it was even (t)here. We all walked outside the restaurant, and stood in place momentarily. It was as if the scene was staged. We looked around and briefly at each other as if say, which was said aloud, something doesn’t seem right. The breeze whizzed though the branches and along the ground, skimming the grass and kicking up debris when it could. It, the wind, was much gentler than earlier in the day. Wind, you are so beautiful, but how can you be so abusive? Why? The key ring spun around my finger–an act of anxiousness–as my heels clapped against the pavement, edging toward the car. My head acknowledged the northeast, my eyes darting toward the lake from the parking lot of The Springside Inn. It was quiet. Last nail in the coffin quiet. The car drove down Highbridge Road, a left and then a right, hitting East Genesee Street. Hoopes Park sits on the right hand side, driving into Skaneateles. The amount of grey that filtered through the Jeep’s window, or shall it be the perceived grey filter that was cast from being inside the vehicle–save the fact that the dead-air scenery was a bit chalky while in the parking lot–soaked up my attention, hearing my associates’ conversation–was not my focus–as it unintentionally emulated muffled Peanuts adults’ banter. 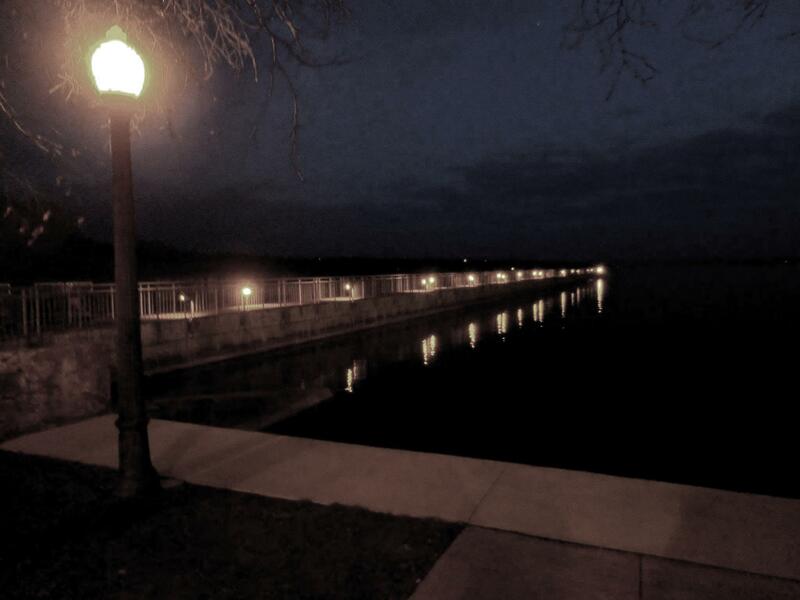 Night was creeping in, but the lights surrounding the water in the park provided a welcoming light. The couple sitting on one of the benches still would reside comfortably if they so chose to stay. Upon exiting The Springside Inn, it felt like a cooling late summer evening. This notion was reprieve after considering last week’s dreary London-esque weather. It no longer felt like a fall afternoon, which Sunday dressed itself as. There aura was guided by a soundtrack of static dead aura. You may not have heard a pin drop, but a small piece of glass or a marble definitely. The pond water next to the inn rippled softly. Birds, sparrows and other small birds, fluttered down and away, landing fluidly along the wave of a gust. They hop along the grass, standing by the edge and taking a swig here and there. It seemed as tranquil from inside, standing in the porch on the southern side of the inn. The fire blazed quietly. Granted, the place is It was full of color and brought out the gentility of the brick surrounding it. This porch area, being in the moment, gave off a classy uniqueness. This would be a room that you would want in your house, carpet and all, the room that you would spend most of your time in. If married and with kids, this is the room to hang out in when they are not around or asleep or spending the night at a friend’s or with grandparents. In other words: fully enjoyable before kids and after retirement. Being joined by an associate, the observation made on my part, looking outside and mentioning this situation, she said something along the lines of but we aren’t going to be over contemplating this. My response was a subtle nod, eyes facing the ground. The flame crackle snapped me back into the moment. As I took a bite from one of the pieces of tenderloin, my teeth cut through it hastily. There was no snag from fat, and it was perfectly cooked. The flavor was in full force with the marinade. The pepper and rub were deliciously subtle, but packed a savory punch. I indulged in those amongst hummus and pita, lightly fried cheese ravioli, and spinach and artichoke dip. It didn’t stop there. Cabernet swirled around in my glass. It could have been drier. Into the ballroom. The white decor and bar was nothing short of elegant. The dark wooden chairs surrounding the tables and the platform where the wedding party would sit exuded class. It was a large enough room for a comfortable wedding. The room sat idle, but stirred the people’s thoughts. The overall definition was contented. The simplicity projected into grandeur. All for a base of perfect irony. On Montgomery Street, Downtown Syracuse, a couple walked along side of the bank. They were holding hands, strolling in conversation. She looked up at him, he down at her. He paused ever so slightly to spin her around. Slightly dipping her, he moved in and weighed the moment of spontaneity down with a kiss. She relaxed. Her knees gave out the moment that her heels touched the pavement. In Hoopes Park, a couple sat next to each other on a bench. His arm fell across her shoulders, and his hand moved through her hair. She leaned in, resting her head on his shoulder. His head rested lightly on hers, and his fingers danced upon her shoulder. Together, they stared into the evening, as the birds fluttered around them. The ride home was quaint. Through the rural we ventured. Skaneateles sat, readily to rest. The pier stretches/ed further out with each ponderous parsec. Into the city we finally arrived. My breath was too shy.